Getting Real: Pick two - scope, timeframe, or budget. Next, you need to tell your client to pick two. We’ve all heard “Pick two: good, fast, or cheap.” Well, dealing with client projects is no different. Your client needs to pick two: fixed scope, fixed timeframe, or fixed budget. Having all three is a myth. Pick three and you’ll end up with a lot of unsatisified people and subpar results. I’ve always felt that The Project Triangle was an elegant way to discuss resource constraints with a client, but it’s also a useful tool for helping your team understand the play. Constrained features (a/k/a, quality or scope), in particular, can be an awkward topic to broach; it doesn’t mean the deliverable can be broken, but that strong, early decisions must be made about which features of the project are critical path components, and which are "nice to haves." As much as we each want to have it all, fast and on budget, these are conversations that you really want to have before work is begun. Trust me on this. There’s no substitute for deciding to “hire the right clients,” as Jason puts it (that’s huge), but it’s also useful to have an ongoing understanding—internally, as well as with the client—about which part of the project “gives” when the inevitable changes happen. Lacking bottomless wallets and a time machine, most clients accept that features nearly always take the blow. Discussing and planning for that ahead of time will help make the last day of your project as pleasant and stress-free as the first. Submitted by chuck (not verified) on April 1, 2005 - 11:50pm. 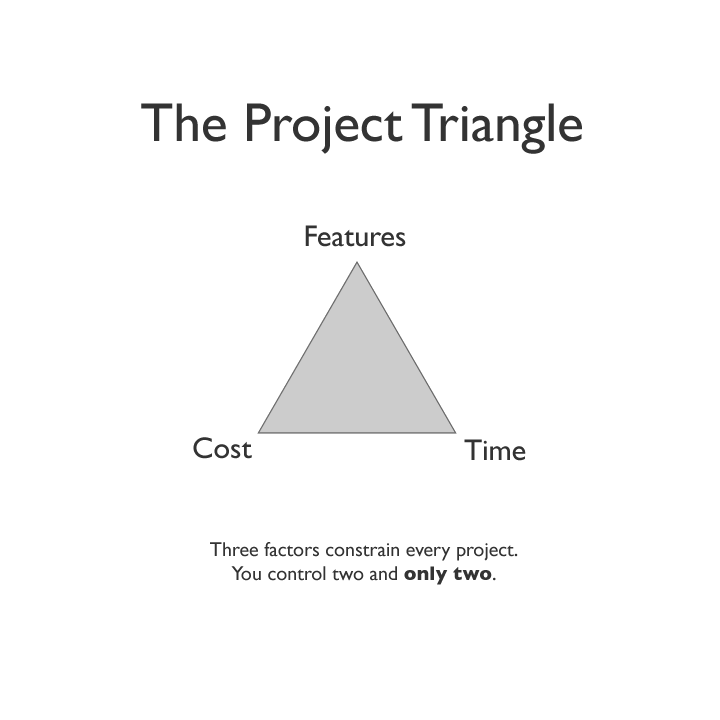 The project 3d rectangle - I try to view projects in 4 terms: "Time to market, functions, quality and cost." Picture the room you are in, if a wall is in front of you, look left and down to the corner and make that your origin (0,0,0). The left/right x-axis is the time to market. If the client wants it unreasonably soon that means lots of overtime (+x axis). The vertical y-axis is the functionality. I picture it as the pile of documention detailing the project's specifications. More functionality means more documentation so (+y axis). The z-axis is the quality of the project. If the client leans forward to bang their head against the wall that is an indicator of low functionality (user antagonistic). If they lean back at ease its an indicator of user friendliness (+z axis). The rectangle formed by these two points (0,0,0) and (x,y,z) is the pile of money it will take to get the project done.